Between 1996 and 2007 both home sales and average house prices were steadily rising. 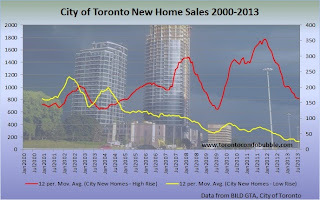 In 2008, both sales and prices briefly tumbled and then quickly rebounded. Yet something interesting happened. While home prices kept on rising, the sales volume became more volatile and plateaued. 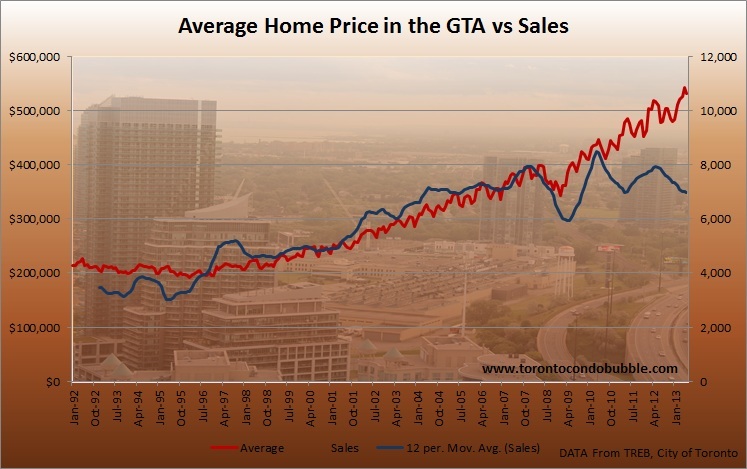 For years Toronto home prices grew faster than incomes but that trend couldn't continue forever. The emergency low interest rates reversed the much needed correction in 2008 and masked the underlying overvaluation. However, the brief housing crash in 2008 was not fully averted as it was merely postponed. The decrease in sales is the first sign that the crash is on its way. 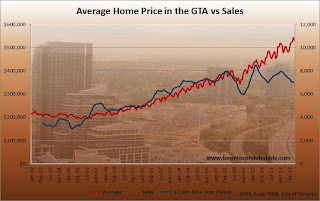 In few years don't be surprised to see home prices fall by 15% to 20% throughout the GTA. Condos will fall even more. 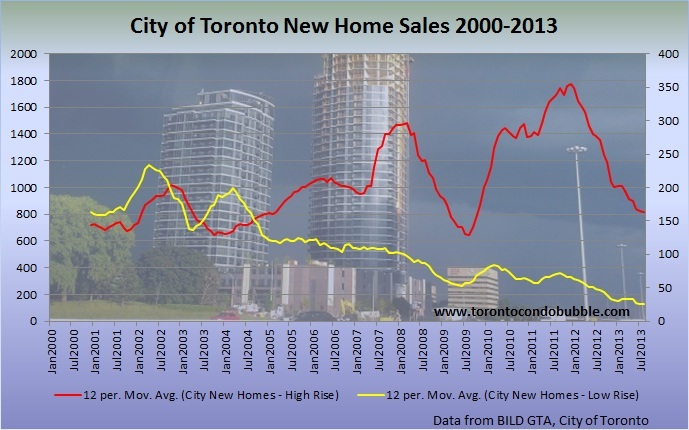 You see, in the mid-00s Torontonians started viewing condos as an investment. Nearly half of all new apartments were sold to speculators. In downtown Toronto the proportion of investors is as high as 70%. In 2008, when emergency rates kicked in, many thought that it was a generational opportunity to buy real estate. Hundreds of people were camping out for days in front of sales centers before a new condo project went on sale. Many buildings were sold out in less than 24 hours. But that was in 2011. Today the picture is different. 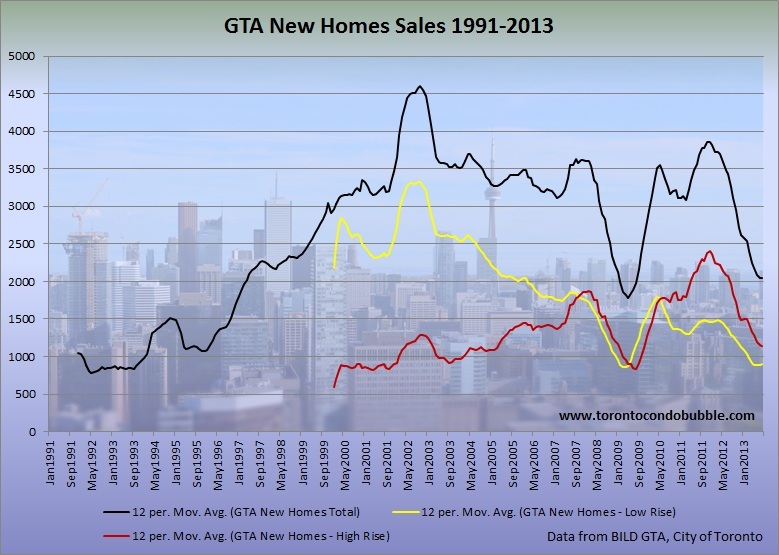 New condo sales have crashed over 50% since the peak. 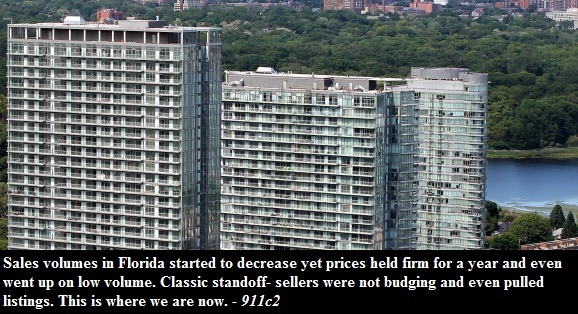 New condo prices have already begun their decline with prices falling by 2% in May. 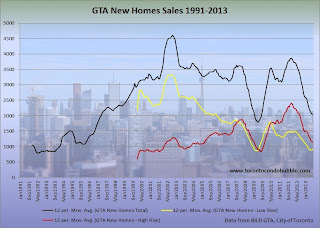 Overall new home sales in Toronto are in the same free fall as during the financial crisis. The only difference this time is that there will be no sharp rebound as the interest rates card was already played. The condo boom is already over. Yet the 171 cranes populating the skyline will make us feel like a party is still rocking for a little while longer. Once the cranes are gone, the real hangover will begin.